Quite a few people have asked me to write about Actionmasters and make fun of them. They're an easy target - Transformer who don't transform! What hilarity could come from this? Of course, there is only one problem there - I think they're fantastic. Okay, so they don't transform. But they're not supposed to. You don’t criticise GI Joe toys for not having holograms in their chests, do you? In 1990 Hasbro rolled out a new line of figures to try to reinvigorate the ailing Transformers line. They were the Actionmasters.. The idea was to make cartoon / comic accurate toys (because seriously the original Transformers were brick statues that sometimes looked a bit like they did in the cartoons) who were cheap and easy to collect. For the price of a really expensive original, you could get a pile of characters like Grimlock, Blaster, Shockwave, and even some new ones too. They even came with transforming weapons / backpacks that were all interchangeable, and there were transforming vehicles. They weren't supposed to be transforming, they were supposed to be fun, collectable and playable, and they did all that and more! Sadly the line died in America. But in the UK Transformers never went away and so we got a lot more releases including more waves of Actionmasters, some strange Japanese repaints and other unique molds. Today though I'm going to talk about one of the most awesome Actionmasters - Actionmaster Thundercracker. Sadly I don't own him, but these pictures were donated by Ralph Burns, a UK fan who makes videos about Thundercracker hunting for sausages to cure the gnawing madness within. 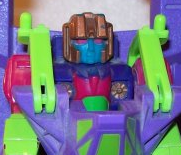 Actionmaster Thundercracker is so bizarre it isn't true. Most of the Actionmasters were attempts to replicate the original cartoon models, but instead of just slapping some blue paint on the Starscream mold, Hasbro seemed to sit down and take some incredible drugs. "Before the accident in the paint factory, I used to be pretty!" What were they thinking with this glorious colour scheme? Make his face blue! Make his helmet and chest bronze! Make his body purple! His legs blue! His arms and legs neon pink. And finish it off with a good slap of lime green! It is awful. It's so awful that is works wonderfully and I am in total love with his garish, eye-searing colour scheme. He is beautiful in a terrible way. He looks nothing like Thundercracker, and yet they decided he was - it is sheer poetry in motion! Thundercracker didn't just come with himself. He came with a cool jet he could ride about on. His sweet vehicle was purple, lime green and neon pink and he could sit on it and fly about shooting people. It even had gigantic pink guns he could hold and wave at people. Look how happy he is flying about on it! The coolest part though is that his jet will also transform into exo-armour for Thundercracker! This makes him big and imposing, something I never thought neon pink would be capable of. I've always loved stuff like this, and transformable armour is way up on my list of 'Awesome Things'. He could murder the world in this! Or at least poor Goldbug. So the next time you think about sneering at something, be it a toy or something that actually matters, just stop and think. Judge stuff on its own merits. Thundercracker isn't a Transformer, but then he's not trying to be, he's trying to be a fun, cool toy with exciting accessories and on that front he is fantastic! I want one of those now. I never know about the whole Exo-suit thing! I love Action Masters as they fun action figures, taken on their own merits. Nice sculpts, some interesting new characters and madly weird accessories. It's pointles to compare them to regular Transformers - of which there are several thousand more of anyway. AM Thundercracker is a particular delight. It's just so nuts. If you only own one AM, get that one. It will make you smile. And it's a great talking point with friends! If I may be so self-indulgent, here's a piece I wrote some time ago in an attempt to think through just how the character of Thundercracker could end up with such a color scheme. I will consider my life to be a failure until I own him. Damn! i love the garish late 80s color scheme! And im with you, i always loved my action masters. My devastator broke, and blaster, prowl, shockwave, mainframe and starscream all went MIA in my toy bin. I still got my soundwave, bumblebee and a legless prime tho! plus, the AM vehicle trailer thing that turns into a kickass jet and battlestation. ...You make me want to waste more time at the office scouring eBay for one of these! It's so awful it's great, pre-Generation 2 psychedelic TF colors! I've wanted this guy for a wee while now.